You wouldn't like Ezra when he's angry. Unless you're playing him. Last time I talked about mild conditions, and how I'm using them in this hack of Faith Corps to emulate Star Wars Rebels. That's great and all, but Faith Corps characters also have moderate and severe conditions! Betcha thought I forgot about them! I didn't! So if mild conditions are short-term ways that PCs respond to stress (that's why stress is called stress in Fate, y'know), moderate and severe conditions are their long-term responses to more serious stress. In Faith Corps, moderate conditions stick around for the length of a Mission, or maybe a single session. (The book is a little inconsistent on this point.) Severe conditions persist for "five or six" Missions, or maybe just one Mission. (On page 43 it says the former, on page 138, the latter). Either way, I don't care, because I run one-shots! Advantage: Olson! So here are Ezra's three moderate conditions. Each of these is kind of a heightened extension of one or more of his mild conditions. But only kind of, because I didn't really plan it that way. The real intent was just to represent character traits that Ezra typically, but not always, displays in an episode of Rebels. Sometimes he'll be motivated by fear or anger for the better part of an episode. God knows he has enough to be fearful of and/or angry about, but he usually starts out relatively well-adjusted and quippy. Conflicted isn't always a thing, but there have definitely been times when he's spent an episode being torn between two diametrically opposed options, like "Should I be a Jedi, or work for Hondo Ohnaka?" Only a teenager would consider this an actual choice. Note that since he can only take a maximum of two of those three conditions, he'll never be obliged to be conflicted when there's no source of real conflict for him. Ditto Afraid and Angry, but those are more likely to crop up. Vengeful's a great long-term condition to keep Ezra going for a multi-episode arc. I mean, I won't have multiple-episode arcs -- one-shots! -- but for the thing I'm emulating, it's appropriate. It's also the pinnacle of his implied "Dark Side conditions" track. This is assuming that if he were to really turn to the Dark Side, he'd be an NPC, which works for me. The other severe condition, Injured, is shared by all the PCs. It's not so appropriate as a thing that'll stick around for a series of sessions, but it is appropriate as, basically, the worst and simultaneously least-likely thing to happen to a main character on Rebels. Usually, when one of these characters gets hurt-hurt, like genuinely wounded, it's a big deal. (See the finales of Seasons One and Two.) So it's a big deal here, too. Maybe "Tense" isn't the best heightening of her mild conditions of Under Pressure, Irritated, and Flustered, but it feels longer-term to me than any of those. Ditto with "Worried about _____" vs. her mild condition of "Protective of _____." 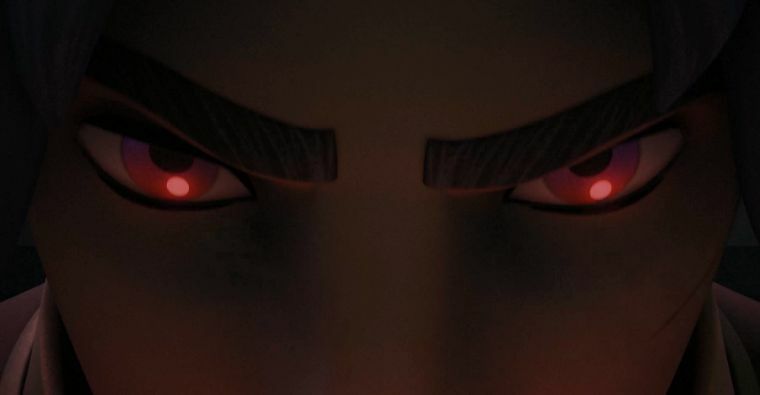 Like, I can see her pulling Kanan aside and saying, "I'm worried about Sabine" in the second act, but not really "I'm protective of Sabine," which feels more in-the-moment to me. If severe conditions are "What's the worst thing that can happen to this character that doesn't take them out of the action? ", then for Hera I think Despairing is it. She's the one who got this whole Rebels thing started; hope is kind of her thing. Tempted by the Dark Side: When you have the Impatient, Afraid, Angry, or Vengeful conditions, you can invoke those conditions for free on any roll that includes Jedi, once per condition per scene. For each of these conditions you invoke this way, the GM takes one destiny die. I like how this might incentivize Ezra's player to take one or more of those conditions. If they really want to follow the Dark Side thing all the way down, they can really commit and take them all. Sensor Scrambler: When scanned by sensors, as long as it doesn’t have the Damaged Sensor Scrambler condition, the Ghost can appear to be another ship, no roll required. I like how taking that condition has a very specific effect on the story, both mechanically (you lose access to a stunt) and narratively (it just plain doesn't work until someone takes the time to fix it). And this is basically how the Ghost's sensor scrambler works on the show, which is the point of this whole thing in the first place. [Faith Corps] Hey, Star Wars!